Considering how much of our lives we spend in bed, and how crucial it is to our health to get good sleep, it’s amazing that so many of us think so little about our mattresses. Part of that may be because a great quality mattress tends to cost more than the cheapo models, which keeps it out of ‘impulse buy’ range, and part of it might be that even though we in the environmental, sustainable, and green crowd pay a lot of attention to the ingredients in our food and cleaning supplies, knowing what’s inside our mattress isn’t exactly a top-of-mind subject. However, there have been a lot of studies over the last decade that point out how noxious some of the materials are that go into home furnishings, from rugs to furniture to paint, many of which off-gas volatile organic compounds (VOCs) — which are linked to adverse health effects — into the air we breathe,. Because of how close our bodies and breath are to our mattresses all night long (literally inches away), choosing a clean and green mattress can be an important factor in our family’s health, but finding the right one at the right price can be challenging. To be honest, for many years we avoided the whole issue of sketchy materials in our mattresses by only buying and using 100% natural cotton and wool futon mattresses. On the upside, they tend to be affordable — at least as affordable as a conventional mattress — and are fairly widely available. On the downside, while a basic futon can provide a firmer sleeping surface (which we prefer over softer mattresses), in just few short years they can become highly compacted and end up being uncomfortable for pickier sleepers, especially if they have been a kid’s bed and been through lots of jumping and rough-housing like ours have. 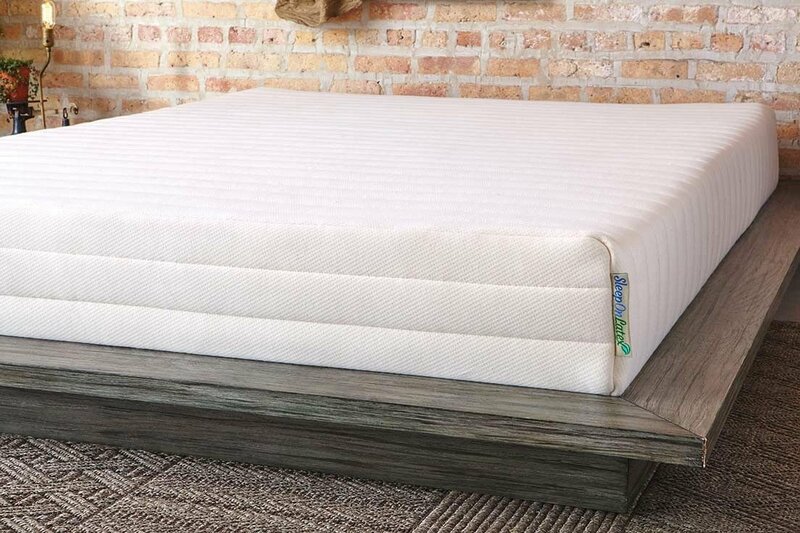 One way to upgrade an older futon or mattress is with the addition of a mattress topper, which we did a few years ago with a 100% natural latex topper from Sleep on Latex. That experience opened my eyes to the world of natural latex toppers and mattresses, which I believe are an excellent alternative to memory foam or polyurethane mattresses that seem to be all the rage recently. A few months ago, we got a full-size 100% natural latex mattress from Sleep on Latex, the 9″ thick model, and because our 12-year old had been sleeping on the oldest futon in the house, we put the new mattress on her bed. If you’ve never bought a “bed in a box” type of mattress before, it can be quite astounding, as the size of box that arrives at your door doesn’t look nearly big enough to fit an entire 9″ thick mattress in it. Even after opening the box and sliding out the mattress, it still looks rather small, but after removing the wrap it instantly expands to full size, which is a worthy trick all on its own. Immediately after opening the mattress, there is a scent of latex that comes off of it, which is totally normal, but after a short time that scent dissipates and is no longer noticeable. The 9″ Pure Green™ Natural Latex Mattress is constructed of 100% natural latex foam, with a top layer of 1″ of quilted wool (OTS-Certified Organic New Zealand wool, to be precise) sitting on top of a 2″ layer of softer latex foam over a firmer 6″ base layer of latex foam, all wrapped inside a removable cover made from 100% organic cotton knit fabric. Our mattress had a firmness level of “firm,” but the initial feel of the mattress didn’t seem very firm to me, because it was literally one of the most comfortable mattresses I’ve ever felt. Although the top portion of the mattress was soft enough to encourage your body to fully relax for sleep, the mattress as a whole is firm enough to be supportive of a sleeping body over the course of 8 hours of so per night. One thing that really stuck out to my about the Sleep on Latex mattress is that while it is “springy” in the sense that it’s made from foam, it’s not bouncy enough to transfer motion across the mattress — meaning someone getting in or out of the other side of the bed is not likely to disturb someone sleeping on the other side — and much to the chagrin of my younger kids, it isn’t nearly bouncy enough for a good jumping session (although it certainly beats jumping on a futon). When I asked my 12-year old her opinion on the mattress, she wasn’t very forthcoming (other than acknowledging that it’s the most comfortable bed “ever”), but her most notable comment was that “It feels like there should be springs in there, but there aren’t.” Go figure. After sleeping on cotton and wool futons for years, and appreciating their relative coolness on the hot nights we get here in the high desert, the idea of sleeping on a foam mattress, even a 100% natural latex one, didn’t initially sound that comfortable from a temperature aspect, but I’ve found that if anything, this mattress sleeps cooler than our others. Perhaps that’s because of the top layer of wool in the mattress and the cotton cover, or perhaps heat is not an issue with natural latex as it is with other synthetic foams, but either way it has been an incredibly restful and cozy mattress during our hot summer. Sleep on Latex mattresses are made from 100% natural latex harvested from rubber trees in Sri Lanka, the foam is manufactured directly for the company, and the components are then sewn, assembled, and packaged in the US at the company’s Chicago factory. Sleep on Latex offers free shipping and returns (anytime within 100 days of receipt), and the mattresses come with a 10-year warranty. The Pure Green® foam itself is certified by Oeko-Tex and eco-Institut, which both test products for harmful emissions, so those seeking a healthy sleeping surface can rest assured that they’re getting a “clean” product. The mattresses are price starting at $595 for a twin size (7″ thickness) model, and more information about the 100% natural latex mattresses and mattress toppers can be found on the company’s website.